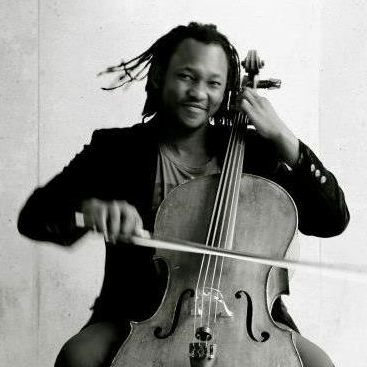 South African cellist Abel Selaocoe is a versatile musician who is interested in exploring the capacity of the cello across genres, from collaborating with beatboxers, folk and world musicians to giving concerto performances and solo classical recitals. He has worked as a soloist with numerous orchestras throughout South Africa, having performed a wide range of concerto repertoire with Kwa-Zulu Natal Philharmonic, Johannesburg Philharmonic and Randburg Symphony Orchestra. In 2013 he made his Bridgewater Hall debut, one of the most prestigious concert halls in Europe, playing Tim Garland’s Cello and Saxophone Concerto. Abel performed the Schumann Cello Concerto with Sheffield Philharmonic Orchestra and will premier Adam Gorb’s Cello concerto with the Great Britain National Youth Ensemble. He recently gave a solo performance of Britten’s Cello Suite at the Westminster Abbey Cathedral as part of their St Cecelia Festival. As an orchestral musician Abel has worked with the Britten Pears Young Artist programme, recording numerous award winning CD’s of Britten’s works. He has also appeared with Multi-Story Orchestra, working closely with cellist Matthew Barley to make classical music accessible for a diverse audience and playing in the BBC Proms. Abel also plays with the BBC Philharmonic Orchestra as an extra. As a keen chamber musician, he made his Wigmore Hall debut working with composer Colin Matthews on his String Quartets. With Multi Story he has curated and performed a series of chamber music concerts from Maurice Ravel to George Crumb, in a multi-storey car park in Peckham, London. He is interested in collaborating with musicians from other genres such as Tim Garland, jazz saxophonist in Chick Corea’s band and the extraordinary jazz pianist Gwylim Simcock. As an improviser, Abel is the co-founder of BBC Introducing artists’ world-folk-fusion quintet Kabantu. Kabantu plays across the UK in many festivals such as Fishguard, Ulverston International Music Festivals, Aldeburgh Festival and the BBC Proms Late Night Concert at the Albert Hall broadcast on BBC Radio 3. They have played in prestigious venues such as the Royal Albert Hall, Sage Gateshead, Bridgewater Hall and Band on the Wall. Abel has been a recipient of various awards: winner of the Standard Bank Young Artists Award 2016/2017, winner of RNCM Gold Medal, Worshipful Musicians Company Silver Medal award, winner of the Sir John Barbarolli prize (UK) and RNCM Concerto Prize. He has also been awarded the John Hosier and Biddy Baxter Music Trust Scholarship with Sir Simon Rattle as patron. He is grateful to Help Musicians UK for making him the recipient of the Suggia Gift, Karl Motesiczky Scholarship; and for generous support from the Allan and Nesta Ferguson Charitable Trust and the Thomas Jellis Bequest.